This book presents a clear and comprehensive introduction to the diverse and wide-ranging ethical aspects of war and peace. In a fair-minded and engaging analysis, Nigel Dower introduces the different ethical theories in traditional and contemporary debates – realism, just war theory and pacifism – and subjects each to detailed critical scrutiny. He frames these debates within a related but distinct framework of three approaches to international relations, namely skeptical realism, internationalism and cosmopolitanism. The book also identifies and evaluates two further important perspectives, militarism and pacificism. Whilst analyzing the advantages and disadvantages of the different outlooks, Dower makes a strong case for a cosmopolitan pacificist position, arguing that we need to see peace in more positive terms than merely the absence of war. The book uses a wide range of examples from across the world and includes discussion of nuclear weapons, new wars, terrorism, humanitarian intervention and human security. Written as a textbook for students who have no prior knowledge of philosophical ethics, The Ethics of War and Peace is designed to help students understand and see the relevance of how a professional philosopher can engage ethically with the world. Each chapter contains a helpful survey of its contents at the beginning and a set of questions for individual reflection or group discussion at the end. This book will be essential reading for students of security studies, conflict resolution, peace studies, philosophy and political theory and anyone interested in the ethical questions which arise from the study of war and peace. Nigel Dower is Honorary Senior Lecturer at the University of Aberdeen. "Nigel Dower has written a clear and thorough new guide to the crucial ethical questions of war and peace, nationalism and cosmopolitanism, and realism and idealism about the world we live in. His book is lively, learned, and engaged, and will be the perfect starting-point for all those wanting to think harder about these vital topical issues, whether they are students, academics, activists, or just concerned citizens." 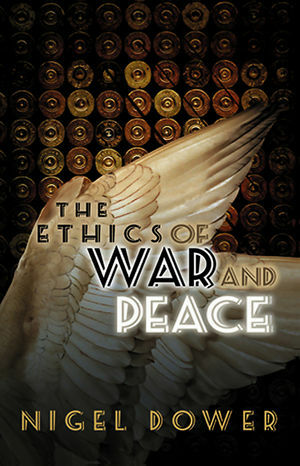 "The Ethics of War and Peace provides a clear and comprehensive guide to perspectives on morality and the use of force. Analysing the 'conditions of peace' as well as the ethics of war, it offers a powerful defence of 'cosmopolitan pacifism'. This is a distinctive addition to the literature that can be warmly recommended to students of ethics and world politics."